With a massive variety of mattress’ materials, brands and price range available, shopping for a mattress can be quite daunting. When it comes to bedding materials, natural latex has become one of the most popular options amongst consumers, especially for those who have researched extensively about the advantages of sleeping on latex. However, latex mattresses can range from as low as hundreds to a few thousands, based on its different qualities and components. If you’re considering to purchase a latex mattress, do you really know what you’re paying for? Latex sap, also known as liquid latex, is obtained from the sap of rubber trees, and is commonly extracted from rubber plantations in tropical countries in South East Asia, Sri Lanka, China, India, Africa and Latin America. Extracted latex sap is graded according to its precise technical parameters, such as its dirt content, ash content and natural properties of the rubber. The liquid latex is traded as a commodity, with the lower grade sap used in the manufacturing of various items such as tyres, shoes and gloves. Meanwhile, higher grade liquid latex which is hypoallergenic is used to produce premium products such as latex mattresses and pillows. Given that latex is extracted from rubber trees, it is a common misconception that countries with large rubber plantations would naturally produce better latex mattresses. However, all latex foam manufacturers buy rubber sap from an open commodity market, which gives each latex mattress company the same starting point in terms of raw material. Apart from using premium liquid latex, production experience, adherence to health, safety and environmental guidelines and state of the art technology are equally, if not more important in determining the quality of the final latex foam product produced. In fact, the largest latex bedding manufacturers are based in the USA and Europe, yet these regions do not grow rubber trees! The main reason for the large price differences among latex mattresses is due to the presence of latex fillers. To lower the cost of production, certain latex manufacturers may add latex fillers such as Talcum, Chalk, Calcite, Titanium dioxide or Calcium oxide. 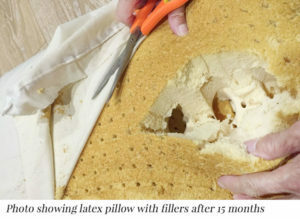 The addition of latex fillers has a negative effect on the durability of the mattress making it more prone to sagging and breakdown and ultimately reducing the lifespan of the mattress. What differentiates one latex bedding manufacturer from another is whether vigorous quality standards and measures were put in place to ensure that safe and reliable products are produced. Recently, many questions have been raised with regards to the high concentration of Radon detected in latex mattresses produced in Asian countries. According to the American Cancer Society, prolonged exposure to Radon – a colourless, odourless, radioactive gas may increase the risk of lung cancer. The concentration of Radon in latex has presumably been linked to the use of fillers like Calcid (Chalk) that is polluted with Uranium. There is therefore an urgent need to implement strict regulations and measures to certify mattresses, in order to protect consumers. Oeko-Tex and Eurolatex are a few of the most renowned certification institutes, and both have stringent renewal policies to ensure that the latex manufacturing companies are constantly up to standard. Certificates from these institutions must be renewed every two years! Natural latex production is a complex and costly process. Hence, the alarms bells in your head should ring if a latex mattress is priced too cheaply. Quality latex foam boasts a milky, vanilla scent – give the mattress a few good whiffs before purchasing it! Check the quality of the latex mattress to ensure that it is certified toxic-free. Non-certified latex can be harmful to the human bodies, especially that of babies whose immune systems are not yet fully developed. Additionally, it is always good to know the type of latex and where the latex in your mattress is manufactured. While organic latex is eco-friendly, certified latex, free from formaldehyde, Radon and fillers could be more important to your health. For buying a mattress, getting a 100 nights free trial sounds enticing when you purchase your mattress. However, be prepared to be sleeping on a used mattress returned from a previous customer that has most likely accumulated 100 nights’ worth of dead skin cells, strands of hair and other foreign particles collected from the previous home. Just a thought to keep you up at night. Sofzsleep’s natural latex mattresses are manufactured in Europe and customized to Asia’s weather and Asian’s sleeping patterns. Our mattress covers are made with either natural Bamboo fiber or the Adaptive Coolmax fabric, both with special cooling properties. Bamboo fiber is used for its natural, antibacterial and antifungal properties and for its excellent permeability. 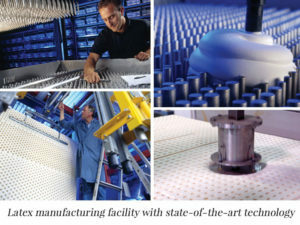 HeiQ Adaptive, is a Swiss intelligent heat and moisture management technology, which actively regulates the temperature of the cover. This ensures that extra moisture is evaporated as quickly as possible from the mattress, providing a conducive, cooling and dry environment for the sleeper. Sofzsleep’s mattresses come with perimeter zip covers making it extra easy to maintain the cleanliness of your mattress. You can strip the mattress down within minutes, wash or dry clean the mattress cover and zip it back right after its cleaned! This way, you will never have to live with those unsightly stains or odor on your mattresses again. Additionally, natural latex makes for a great mattress material, as it is naturally dust mite, mold and mildew resistant. This makes it the optimal mattress for children, adults and anyone with a sensitive respiratory system or allergies. 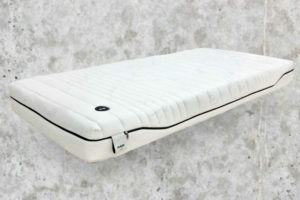 A good latex mattress also provides support, pressure relief and allow you to move freely in your sleep. We hope that this article has given you a better idea on what to look out for when shopping for a latex mattress. If you have other burning questions, feel free to call us at 6100 4569 – we don’t bite! The next time you go for your mattress shopping, walk away if the salesperson claims that the mattress is “100% natural latex but no certifications”. Snagging a premium natural latex mattress is not as tough as it sounds!